Dental implants are a comprehensive tooth replacement method that rebuilds a missing tooth from the root all the way to the visible crown. First, a titanium implant post is placed beneath the gum line. Next, a prosthetic crown, bridge, or denture is affixed on top. 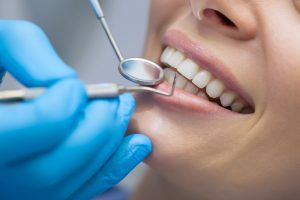 In order for the dental implants to look as natural as possible, your dentist may recommend connective tissue grafting for root coverage — it sounds complicated, but it’s really not. Keep reading to learn more about this procedure and why it may be necessary for dental implants in West Orange. Studies repeatedly show that having plenty of gingival (gum) tissue can help to improve the form and function of dental implants over the long haul. Many patients may have experienced the loss of periodontal tissue due to gum disease or because of the missing teeth. This can result in exposed tooth roots which leave the smile vulnerable of a host of issues. After a dental implant is placed, patching the area up with additional connective tissue can help to seal the gums and prevent the leakage of bacteria and plaque formation that can put the implant at risk. Peri-implantitis is an infection of a dental implant, and it occurs when bacteria is allowed to collect around the post. Having a tighter seal can keep you safe from peri-implantitis so the implant stays healthier over the long-haul. Plus, adding additional gingival tissue helps the gums appear more natural, for a more esthetic result over all. Connective tissue grafting is an oral and maxillofacial procedure which is completed under local anesthesia to numb the treatment areas. Sedation may be available as well for additional relaxation as needed. Preparation of the donor site and removal of tissue. Healthy gingival tissue is often removed from another site in the patient’s own mouth, like the back of the upper palate. Placement of healthy tissue onto the recipient site. Closure of donor and treatment site. The recovery after connective tissue grafting is generally short and should not cause much discomfort or bleeding. You may resume regular eating habits as soon as you feel comfortable enough doing so. Brush and floss your teeth as usual, taking extra care around the treatment sites to ensure you do not disturb the new graft. If discomfort or bleeding do not improve after several days, get in touch with your oral surgeon. If you need a connective tissue grafting in West Orange after dental implants, don’t fret — this is a simple and effective way to ensure that your new tooth replacement looks great and functions properly for a lifetime to come. D&G Dental offers dental expertise you can count on every step of the way for procedures starting with checkups and cleanings all the way to connective tissue grafting for dental implants. To learn more about this procedure or to schedule an appointment, you should not hesitate to get in touch with the office by calling 973-731-2200.